Here is a recipe perfect for a lovely Sunday treat while watching the return of DESPERATE HOUSEWIVES!!! OMG I'M So SUPER excited and this treat is what will be lovely for my Sunday Desperate Housewives party!! Heat oven to 400°F. Cut each apple in half lengthwise; scoop out seeds and cores. Spoon about 1 tablespoon yogurt into each of the apple centers. Sprinkle with nutmeg. Place filled apples in ungreased 13x9-inch (3-quart) baking dish. Pour water into baking dish until half full. Bake 30 to 40 minutes or until apples are tender. Set oven control to broil. Top each apple with marshmallow half. 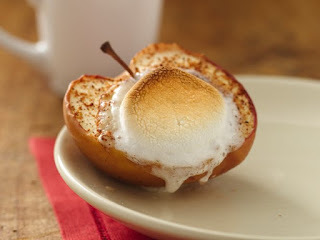 Broil apples with tops of marshmallows 4 to 6 inches from heat about 30 seconds or until marshmallows are golden brown. Serve warm.